Well, surprise, surprise - Richard Branson has made it pretty clear that he is not going to be buying the Honda F1 team after all. Many are saying that this does not amount to a denial of the possibility but the words "Those two provisos would be essential before Virgin entered the sport" seem to exclude any involvement in the near future, regardless of the fact that Branson obviously cannot add - he is referring to three provisos, not two. Branson's mathematical difficulties are the clue to what is really going on and how close an escape F1 has had; the sport needs Virgin involvement like it needs a hole in the head. We are adequately supplied with muddled thinkers and liars in the shape of Max and Bernie without adding to their number by the inclusion of Branson. Consider Branson's green credentials for a start, since he has had the gall to mention this as one of his provisos. His airline alone spews out more poisonous waste every year than F1 could ever hope to do - yet was he hesitant to buy and run the thing in the first place? No, he is content to chatter on about new fuels and so on while his planes continue to produce as much waste as any airline. Hypocrisy on this scale is astounding but hardly evidence of a clear and genuine mind. The fact that he would only be interested in entering F1 if Bernie remains in charge (let us ignore the fact that Bernie hasn't been in charge of the sport for years) is another indicator of muddled and irrational thinking. Bernie is 78 and cannot continue in his position much longer, no matter how much he would like to; is Branson saying that, even if he were involved in F1, he would withdraw when Bernie goes? No, he means only that Bernie is his buddy and he likes the idea of cozying up to him. Now there's a business plan for you. We have to wait for the third proviso before we finally get the truth. The real reason Branson is not interested is because, try as he might, he has not been able to think of a way to make F1 pay. He is not alone in that and most participants are aware that it will cost them a great deal to be involved. This seems to have come as a surprise to Branson or he would not have taken a look at the Honda F1 team - yet any fan of a few years standing could have told him. Those fans are generally in favor of Virgin buying the Honda team, and understandably so, since we all want the grid numbers to remain sufficient to support decent racing. Yet some things come at too great a cost and to have Branson moralizing from the sidelines would be too much to be borne. F1 will become environmentally friendly in its own good time but only if the self-contradictory thinking of people like Branson is ignored. Good riddance to bad rubbish, say I. As for Bernie's latest assertion that he offered £100m to the Honda team but was turned down, I guess that we can put that one with his claim that all of the team owners were in agreement with his medals instead of points idea. He has said already that it would be illegal for him to invest in the team and so it is no wonder that Brawn and Fry were dubious about accepting a deal that must have been nefarious at best, assuming that the offer was ever made, of course. Sorry, Bernie - I just don't believe you. I knew eventually there would be something Clive and I would disagree on. First though it is worth remembering that if Bernie bought Honda it would give him FOTA membership so it is a very good thing that if his offer was ever made it was turned down. I have to say I like Branson and I always have. He has made a fortune out of nothing and has never taken the easy route. When he started an airline he was told he was an idiot because there was no way to compete with the flag carriers but he has competed very successfully. He is not someone who has taken the easy way to get thrills personally either. Whereas Bernie's thrills are all based on making money Branson prefers the high risk thrills that come from his ocean record attempts or his many balloon flights or his upcoming space flight. If he buys an F1 team it is only a matter of time before he gets behind the wheel and he doesn't strike me as the kind of person who will settle for a couple of second gear laps for the photographers. I don't doubt that he is interested in environmental issues but his airline and his space businesses suggest he like to sort these matters from the inside rather than moralising from the sidelines. When the EU first started talking about banning tobacco advertising Bernie said that he would cancel all the European races and replace them with venues from his permanent list of mythical states who want a race. Within a day or two Branso said if that happened he would do a deal with the european tracks to put on a rival championship. The guy is a huge fan of the sport and has been for years. My belief is that he will buy Honda and we won't have long to wait before it is announced. I think anything he has said in the meantime has to be read very carefully. He is trying to get the best deal out of Honda and he is trying to do a deal with Bernie for anything he can get. He is not going to get a good deal from Bernie if he says he wants to see his succession plan before he signs up. Bernie believes he is immortal and if you are dealing with him it is best to stroke his ego while you are planning to stab him in the back. Branson's claims about clean technologies in F1 might not be as disingenuous as you might think. It fits in with his stated goals for Virgin airlines to switch to ethanol as the technology becomes more viable. What would be hypocritical, on the other hand, is if Branson would enter F1 without saying what he said about going green. If he can find a supplier to produce a fuel blend that is not only cleaner, but even gives an advantage, then wouldn't we all look silly for our poo-pooing the mere thought of it. Branson has been outspoken in this area, and isn't just talk, so F1 could be the way to do it right. By that I mean to actually do it, not just paint it, like Honda did. If I were going to buy into F1 to use it as a green showcase and the "greenest" team was available for the price of a shot of sweetgrass, I'd jump at it. Steven: Disagreement at last! I, too, used to like Branson, mostly because he upset the suits by wearing denims to meetings. He was my generation's proof that you didn't have to join the establishment to be successful at business. In time, however, I have realised that he is the same as the rest - the "cool" stance and green noises are smokescreen for the fact that he is a cut-throat businessman in the same vein as Bernie. Ideals and honesty have little to do with that. It is true that he has found novel ways to spend his fortune (the balloon flights) and at some risk to himself but his political and environmental thoughts are naive at best, cynical at worst. He may well be a fan of F1 but his naivety shows up there as well in his belief that Bernie is good for the sport. It's the money he's really interested in. In answer to Arnet's comment, however, I would point out that this is still at the level of hot air, appropriately enough. Easy enough to talk of reducing emissions from his planes, not so easy to do it in practice. The fact that he is set upon ethanol, which is just as damaging to the environment as fossil fuels in less direct ways, shows that he is not really thinking this through. 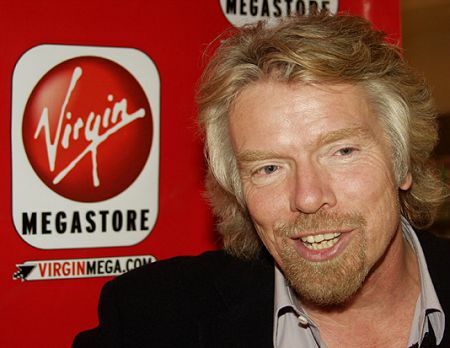 Virgin Airlines has been in existence for decades - how come Branson is only now seeking to make it a little greener? The answer can only be that he has bought the global warming scam or is one of the cabal that sold the lie in the first place. Shouldn't fact that Branson is donating all profits from his travel firms for the next 10 years (approx. $3bn) give him some green credentials? Anyone who cozies up to Ecclestone and Mosley isn't someone I'd hope to have any sway at all in the future of F1. The ridiculously tiny bit of pollution emitted by F1 is negligible. The greatest pollution comes from F1's travelling via the filthy airlines. I wonder how many more miles of air travel Ecclestone has caused by making the teams fly all over Asia. As Clive says, ethanol is highly destructive. It is an extremely poor use of farm land. I am not sure if it would be a good or bad thing as on one hand we would have a powerful figure who would not stand for max's little dictatorship and on the other we have someone who likes to meddle a little too much in the day to day runnings. The one good thing is that by the sounds of it he would be trying to convince bernie and the other money grabbers in F1 to back off and let the sport make more commercial sense for the teams however it is also possible that if this goes too far it may hurt the sport. As for green credentials, Virgin are looking at various ways of impacting the environment less by exploring the use of bio fuels for the aircraft and stearing the train company towards renewable energy initiatives. Also the Rockets used at Virgin Galactic use motors which are significantly less polluting than those used on other space vehicles. I appreciate that some of these initiatives may be misguided (ie biofuels) but any real world exploration into these fields is a step in the right direction. The only real way of making the airlines cleaner would be to redesign the aircraft, much work was done in this field in the 1960's (i think) and some of the designs were very successful (something like 30% more efficient). However as the fule prices dropped the need for such aircraft disappeared and they would now cost a fortune to develop. Unfortunately the 787 and A380 are as adventerous as we are likely to see for a long time. I am not sure there is very much Branson can do about the impact of his airline (even so long haul aircraft are far more efficient than other forms of transport per person carried) but F1 could be far more green if we used electric cars, diesel cars or even just limited the amount of fuel allowed during a gp. F1 needs to change but I am pretty sure that this just needs to be Bernie and Max leaving rather than Branson joining in. Lee: I'm sure Virgin airlines spews out more pollution in a day than F1 does in several seasons. In fact I'll bet the local fleet of recycling trucks pour out more pollution per year than F1. (They don't believe in changing injectors). I've often thought electric power would make F1 far more interesting and far more useful to society. We could toss away 90% of the rule book and start really pushing an envelope once more. KERS would become much simpler and of obvious use. Still, I think that anyone who is making billions of dollars while pumping crap into the air is in no position to be lecturing others about polluting. When you consider he's talking about 20 light, efficient cars doing less mileage per year each, than the average family car, his statements are ludicrous. The fact that that his hobbies use slightly less polluting means of motivation doesn't mean the hobbies are good for the atmosphere. I doubt if there are very many other individuals responsible for as much pollution as him despite the smile and the green rhetoric. Interesting thoughts from all. I must admit that I wrote the post in a mischievous mood, slightly fed up with the way F1 has been so desperate to get Virgin into the game and decidedly annoyed by Branson's holier-than-thou attitude in his latest statement. It was time someone pointed out that Branson isn't necessary to the sport's survival although he might well have been Honda's last hope. What has surprised me in the response has been the amount of support for electric motors in F1. Ultimately, the sport will have to go that route and we are in an interim period when we search for a sensible and viable way to make such a momentous change. Alternative fuels have to be a part of that but there are better answers than ethanol. It is tempting to suggest that gasoline/petrol be outlawed from the sport and the teams left to work out what would be the best substitute. That would cost money, of course, and there isn't much of that commodity around at the moment. No one knows better than Branson just how expensive it is to research alternative fuels and make them practicable and that is where his hypocrisy is most evident - demanding that F1 be both less expensive and greener at the same time. I agree that Virgin is pumping more pollution into the air than F1. However I would also argue that Virgin is also of more use to the world economy than F1 is a sport of practically no current use whatsoever (not even political, social use). I would say that the F1 cars are not particulalry efficient either and yet relaxation of the rules and a restriction on fuel use could make ot both more environmentally friendly and also more useful (researching new energy eficient tech). KERS is utterly pointless and useless as it has no effect on the fuel usage and in fact adds weight to the cars which will be making them even less efficient. Perhaps they could put in a rule that 10 perent of the cars materials have to be either made from recycled materials or have to be recycleable. There are plenty of small things that can be done to make F1 significantly more environmentally friendly and far more useful at the same time. We need to move forward and embrace electric technology rather than shunning it for being almost silent. I am totally against electric motors in F1. There are far better options that could be used. I know Clive has spoken about hydrogen before and that could be a good step. I would also like the Stirling egine to be the sole power usint for an F1 car and let the teams find any way they can to get power out of it. Political posturing in the alternative fuel arena is becoming more than a little tiring. Fact is, no matter how it’s looked at today, ‘hydrocarbon’ fuels (rather than ‘fossil’ fuels, for here again I prefer fact over fiction) leave the much heralded options sorely wanting. The most economical aircraft fuel has a high energy to weight-volume-cost factor and in each of these categories hydrocarbon fuels still come up smelling like a rose - well, perhaps not literally, but Clive is not alone in gaining his daily adrenaline rush by taunting the ill-informed. True, the oil companies (in cahoots with governments, who assess their fuel tax as a percentage of the price) are free to play with their prices to the extent of blatant gouging on occasion, but they retain the ability to lower those prices and thereby push the alternatives onto the back burner any time their monopoly is threatened. Alternative energy/fuel sources of the clean, efficient variety are under development and will be most welcome when they eventually arrive. Steven: Electric motors are not a practical proposition for F1 as yet - which is why I say that we are in an interim period at the moment. The Stirling engine is an interesting contribution to the the debate but, in the end, the problems of the electric motor will be solved and it will replace all fuel-burning engines. It might take another century but it will happen. The V8 Supercar series has switched to an 85% blend enthanol fuel as of this season, which is made from the waste product of sugar cane. I saw a doco on it last year - and of course while it might have been just CAMS beating their own drum - the source and production of the fuel seemed quite eco-friendly. The cars have also been adapted to run on it, and will get better mileage than previously. While this is just an interim method, surely it is better than nothing? Cos whether you beleive in global warming or not, the fact is that petrol & petrol engines spew out emissions which cause a lot of pollution - and who wouldn't like the air they breath to be cleaner - and is a finite source which will eventually be depleted. That day will come - perhaps sooner than you think - and we must be prepared for it. Clive: The noted article did come down a little hard on hydrogen generally. However, it didn’t specifically address the ‘produced-on-demand’ variety to which you refer. As I’ve stated a couple of times before, of the pending alternative energy sources for cars, I personally consider the onboard hydrogen generating process (whether it be Boron + Water - or otherwise) to be the most viable, providing that its development is not hindered by outside influences. Peril: I agree that we should be trying to introduce new fuels and mixtures now, while there is still time. At the moment ethanol has the disadvantage that it still produces large quantities of CO2, although it is cleaner than gasoline. Most of it comes from the refinement of gasoline, however, so we could end up in the faintly ridiculous situation of gas becoming the by-product of ethanol production. Ethanol from plants raises the dilemma of burning food for fuel - always a bad answer for poorer countries and people. David: Stanley Meyer's story is fascinating but quite possibly one of those unfortunate tales of much more going on behind the scene than was claimed. I don't suppose we will ever know the truth. released again when they reformed. Was probably natural death but could have been poisoned by his investors. Contemporary thinking also designated Tesla to the looney fringe. The great Edison would not have been anywhere near as great without Tesla’s innovation - the product of which Edison did not hesitate to - adopt? Miraculously, today’s thinking agrees that Tesla’s theories fit within acceptable parameters, but conveniently neglects to admit that Tesla created those parameters, all the while being ridiculed by his intellectual superiors - or so their since-proven ignorance led them to believe. While apparently some would be happy living on a flat earth and broiling mammoths on a spit, the vast majority off us are much more comfortable with our enlightened existence - for which the world’s constant detractors can take little credit. even the great Tesla (whom I admire and have personally put my money where my mouth is by standing under a 1,000,000 Volt tesla coil, 2m sparks and all) could only claim move energy from A to B.
means this numpty was right is pretty weak.